In this article you'll learn how to create Channels, manage them and more. To learn what Channels are you can read this article. 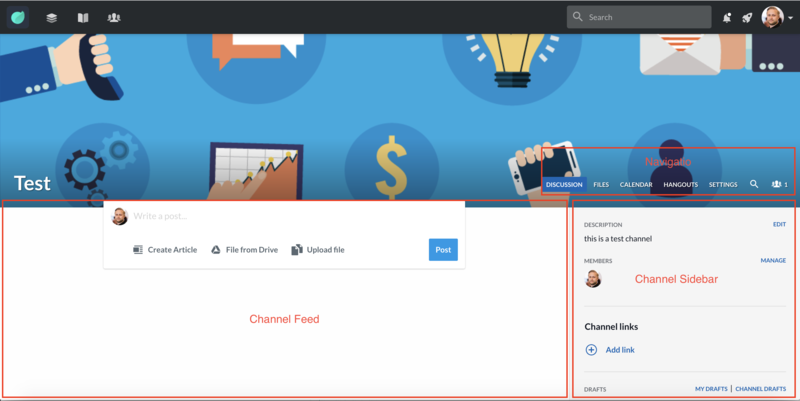 Depending on your Happeo admin settings will depend on who can create a Channel. We recommend that you allow all users the ability to create Channels. To create a Channel you will need to open the Channel tab. From here you can create a new Channel. To create a Channel you will only need to choose a name and give a Channel description. The colour will be displayed in the left of the Channel name within my Channels section. This will allow you to colour code Channels that are related. The header image will be displayed at the top of the Channel. There are recommended image specifications. Here you will be able to change sharing options for Google users and groups in the Channel. Files: Connect an existing team drive or folder, or a new folder to the Channel for users to collaborate on. Any files shared in the Channel will be saved to this folder. Calendar: Add an existing calendar to the Channel or create a new one based on the Channel Participants. Hangouts: Allow Channel members to invite each other into hangouts directly from the Channel. Set the level of discoverability Restricted (default) - Not visible in discovery, join by sharing. Ask to join - Visible in discovery, anyone can ask to join from the discovery view. Anyone can join - Visible in discovery, anyone can join automatically, and also see the Channel without joining. Decide the level of participation by restricting commenting and posting. Archiving a Channel will remove it from the Happeo user interface and can only be undone my a Happeo admin. The channel page is made up of 3 sections. After fine tuning the Channel settings you next need to add Channel members. This can be done from the Settings tab under manage members or via the Channel Members tab. You can add either specific users or Groups. When users or Groups have been added they will be notified that they have been added to the Channel and it will show in their Channel overview. Channel Links: These links act as quick links for Channel members where they can link Happeo pages, Drive and external content. Upcoming Events: This widget will show any upcoming events on the Channel calendar. Important Files: Allows you to link Drive folders or files that are important for the Channel members. In the Channel Feed you are able to post, comment, like, share documents and tag people similar to other social platforms.